The Beckley Exhibition Coal Mine, one of the largest coal heritage destinations in the region, is a preserved coal mine that travels 1500 feet beneath the hillsides of New River Park and offers daily tours. Visitors are carried into the mine along track in authentic "man cars" to actual old working areas of the coal mine. Stops throughout the tour explore the history of low seam coal mining from the hand-loading days into the era of modern mechanization. In addition to the underground activity, you can tour the historic coal camp situated throughout the grounds. Lovingly restored, the Coal Company House, Miner's Shanty, Superintendent's Home, Pemberton Coal Camp Church and Helen School give visitor's a true representation of early 20th century coal camp life. 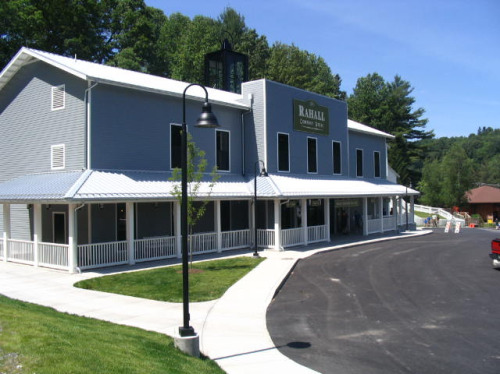 The recently renovated Visitor's Center, replicates a company store and offers new exhibit areas both inside and out. There you will find visitor's services and an expanded gift shop. Just footsteps from the Exhibition Coal Mine, you will find the Youth Museum of Southern West Virginia. The Youth Museum’s main gallery is made up of four railroad boxcars. The central exhibit area features an average of three different exhibits yearly. Designed to entertain as well as educate, the exhibits range from “T-Rex”, “Bats”, and “Artist in the Studio” to “Page after Page”, an award winning children's authors presentation. Facilities open April 1 - November 1: Daily 10:00 a.m. - 6:00 p.m.
Last tour underground is 5:30 p.m.
Bring a jacket - the mine tempature is always at 50.